Won Best New Chef at: The Catbird Seat, Nashville. Born: (EA) 1972; Downers Grove, IL. (JH) 1979; St. Joseph, Minnesota. 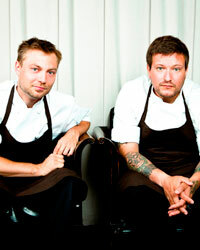 Experience: (EA) The French Laundry, Yountville, CA; Auriga, Porter & Frye and Sea Change, Minneapolis; Noma, Copenhagen. (JH) St. John’s, London; The Fat Duck, Bray, England; Craft, New York City; Alinea, Chicago; The Patterson House, Nashville; Aviary, Chicago. Previous job: (JH) Salmon fishing on a commercial boat in Alaska.